Erasmusbrug, testing the lasershow at night ( new years eve party in Rotterdam). The Erasmusbrug ("Erasmus Bridge") is a cable stayed bridge across the Nieuwe Maas river, linking the northern and southern halves of the city of Rotterdam, Netherlands. 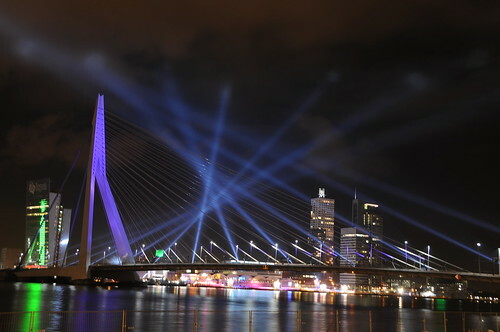 The Erasmusbrug was designed by Ben van Berkel and completed in 1996. The 808 metre long bridge has a 139 metre-high asymmetrical pylon, earning the bridge its nickname of "The Swan". The southern span of the bridge has a 89 metre long bascule bridge for ships that cannot pass under the bridge. The bascule bridge is the largest and heaviest in West Europe and has the largest panel of its type in the world. The bridge was officially opened by Queen Beatrix on September 6, 1996, having cost 165 million Dutch guilders (about 75 million euros) to construct. Shortly after the bridge opened to traffic in October 1996, it was discovered the bridge would swing under particularly strong wind conditions. To reduce the trembling, stronger shock dampeners were installed.